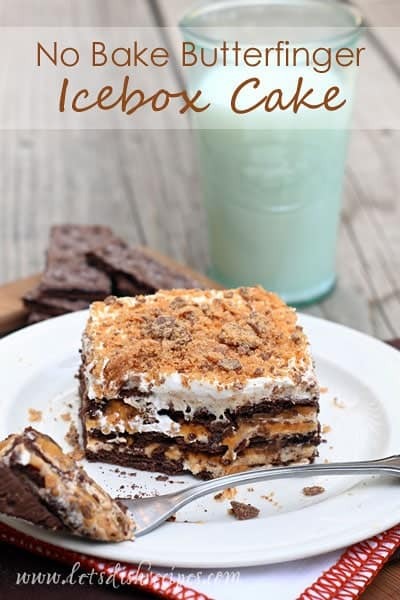 If you love butterscotch and chocolate, then you’ve got to try this No-Bake Butterfinger Ice Box Cake! It’s perfect for warm days when crave dessert but don’t want to turn on the oven. No-bake ice box cakes are a big favorite at my house. There’s just something wonderful about layers of sweet graham cracker, pudding and whipped cream. 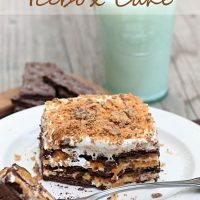 And there are so many possibilities with icebox cakes, although I’d have to say that this Butterfinger version is probably our all-time favorite. I took this to a potluck recently and everyone kept asking “Who made this cake?” This is definitely one of those desserts where you’ll be asked for the recipe. And for good reason. This cake is amazing! I mean, you really can’t go wrong with chocolate graham crackers, butterscotch pudding, whipped cream and a delicious Butterfinger and cream cheese filling. This one is definitely a keeper! In a medium bowl, combine butterscotch pudding and milk. Whisk until pudding is dissolved. Refrigerate for 10 minutes. Meanwhile, use a food processor to crush Butterfinger candy bars into coarse crumbs. Measure out 1 1/2 cups of the crushed candy bars and set aside. Save the remaining crushed Butterfingers for topping the cake. Using an electric mixer on high speed, beat the cream cheese until light and fluffy. Add the brown sugar and mix well. Mix in the vanilla and the powdered sugar. Add the heavy cream and beat on medium speed for about 2 minutes. Fold in the 1 1/2 cups crushed Butterfingers, followed by 1/2 of the frozen whipped topping. Line the bottom of a 9×13 pan with chocolate graham crackers, cutting as needed to fit the pan. Spread 1/3 of the cream cheese mixture over the crackers (use a little of the mixture on the bottom of the crackers to hold them in place, if needed). Layer half of the pudding over the cream cheese mixture. Add a second layer of graham crackers, followed by a second layer of the cream cheese mixture and the remaining pudding. Top with a third layer of graham crackers and the remaining cream cheese mixture. Place the cake in the refrigerator for at least two hours, or until ready to serve. Just before serving, top with the remaining frozen whipped topping and sprinkle with the remaining crushed Butterfingers. Who Dished It Up First: Adapted from Beyond Frosting. What a great recipe. We don’t have butterfinger candy bars but I think our Mars Bars would be nice, however, I have no idea what Cool Whip might be and what I could use as a substitute. Can you help me out please Danelle? Looking forward to giving it a go. Cool Whip is a brand of frozen imitation whipped cream. You could substitute whipped cream or a whipped topping made from a powdered imitation whipped cream, such as Dream Whip, if you have that available. Thanks Susan. I’ll use whipped cream. Whoa! This looks so creamy and delicious! I love butterscotch! I love ice box cakes! Great recipe, this looks delicious! Great recipe! it was delicious!! everyone loved it for dessert for our thanksgiving party. Looks delicious but I am not a butterscotch fan . Do you think chocolate pudding would work? I love chocolate! I think it would work fine.